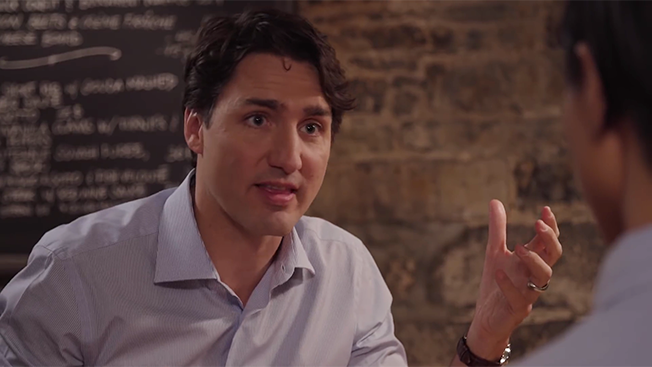 Trudeau appears in the first video of Destination Canada's three-year campaign, "Connecting America," which launched this month and will include ads and social media content for the U.S. market that showcases Canadian destinations. "Our research tells us that there are 30 million Americans actively considering Canada when they're looking at online travel choices, but the perceptions are that we're cold all the time, that we're far away, and that we lack urban sophistication and culture," said David Goldstein, president and CEO of Destination Canada. "Previous campaigns have done a great job at extolling the natural virtues of Canada, but the average American consumer has a hard time of figuring out what to do and where to go." Over steak and seafood at a Montreal restaurant, Trudeau talks with Top Chef winner Kristen Kish about Canada's culinary scene, the country's unheralded wine industry, and off-the-beaten path rural and urban vacation experiences. "We boldly approached the prime minister's office to see if he would help us. It was in the wake of his first state dinner with Barack Obama, and there was a certain buzz about him," Goldstein said. "He was more than happy to pitch in, and we couldn't ask for a better spokesperson." From 2014 to 2015, the number of U.S. visitors to Canada actually rose by 8.3 percent, to 12.5 million, accounting for 70 percent of all international arrivals, according to Destination Canada. Nonetheless, the organization wants to get back to its pre-9/11 levels of 14.5 million American visitors. The goal of the new campaign, its first national tourism initiative in the U.S. since 2011, is to get U.S. travelers to book trips to Canada, Goldstein said. "Often, in destination marketing, you're hoping to get brand awareness. Brand is important, but we're not selling a destination, we're selling experiences. We're trying to change perceptions of what Canada is. Our internal bumper sticker is, 'Canada's not cold, it's cool.'"